The Scoot balance bike is manufactured by Ridgeback, who have been established for over 30 years and have grown from offering a single mountain bike to a wide range of cycles and accessories. The Ridgeback offering for smaller children is the Scoot balance bike, which is one of the most popular balance bikes available and sits towards the top end of the balance bike market as an excellent option with high quality specifications. 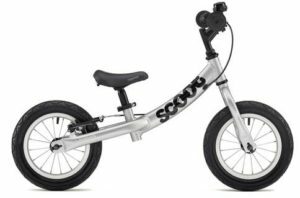 The Scoot balance bike looks like a quality bike, with a sturdy, but lightweight alloy frame, a stylish design and air tyres on alloy rims. It comes in just one size, but with an adjustable saddle that should take your child right through to a pedal bike. Although the Scoot balance bike will be too big for 18 month olds or most newly 2 year olds (check out our best balance bike for 2 year olds guide), the saddle does have a wide range of heights so is suitable for most ages in the core balance bike market of 2.5 – 5 years. This balance bike comes with two seat posts, so this is how it can accommodate children of such varying heights from 85cm through to 115cm. It is easy to swap between the posts, although you should only need to do this once unless you are handing the bike down through the family! This bike comes with air tyres, so this provides a comfortable ride as the tyres will provide plenty of ‘give’ when riding over rough surfaces or up and down kerbs etc. Riders of the Scoot balance bike also love the wide handlebars, which allow a more natural riding position and also contributes to comfort. The Scoot balance bike weighs in at 5.4kg, which makes it similar to the Adventure Zooom balance bike. These bikes actually compare very closely in terms of features and price! Final features of this balance bike are an adjustable hand brake (great for older children), a carry handle, a bell and safety handlebars to help protect small hands in the event of a fall.